I have enjoyed shooting sports for many years. Being a retired law enforcement officer & firearms instructor, I’ve shot almost every type of handgun made, but thought the “only” automatic I could depend my life on was a tuned .45 ACP. That was before I purchased a KAHR P9 polymer. The instruction manual advised to fire a minimum of 200 rounds to ensure positive functioning before “depending” on it as a carry gun. I dutifully collected every type of odds and end 9mm I could scrounge up, (about 300rounds including different foreign military & U.S. commercial manufacturer, reloads, HP, etc. ), and headed for the range. I expected to spend the better part of the morning clearing jams trying to “break in” another new pistol, but boy was I wrong! 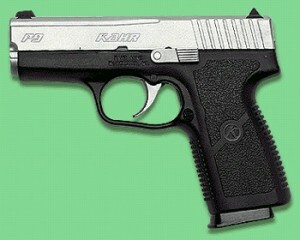 The KAHR ate every thing I fed it. Right out of the box it printed dead on at 25 yds., never jammed, complained, or hesitated. It is light, flat, easy to carry, deadly accurate, and fun to shoot. I tried everything to get the gun to malfunction. No dice. At under 16 oz., 7 +1rounds, & tack driving accuracy, it is my preferred carry gun. 1,000 rounds have added no visible wear. The consistent double action trigger is the best for an old double action revolver man. I’ll take the Kahr P9 over a Glock any day.